Today's Gossip: Trumps Bars Maradona From USA Visti; Umtiti To Manchester? 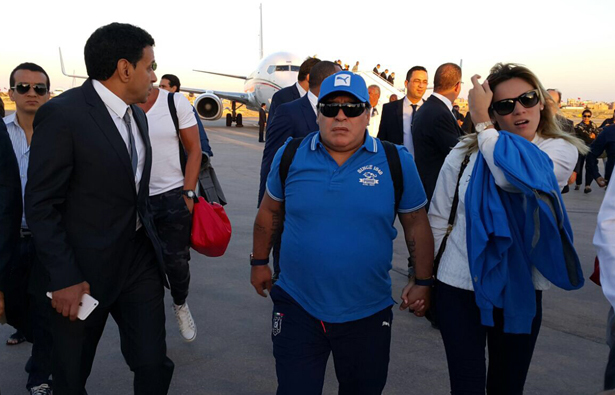 Once again, the United States has denied Diego Maradona access into the country for insulting the president, Donald Trump. In an interview for the program 'Buenos Días América', Maradona's lawyer, Matias Morla, explained the backstory of what exactly happened. While speaking to the Venezuelan network 'TeleSur', the coach of Al Fujairah in the United Arab Emirates was questioned about Trump and made his opinion known. "Donald Trump is a chirolita, " he said. This word is a common insult in Argentina that refers to people who are under the orders of others as puppets.Maradona needed to travel to the United States to face a trial with his ex-partner, Claudia Villafane, who made property purchases with her maiden name when she was already married. Manchester United Boss Jose Mourinho has reportedly targeted a summer move for Samuel Umtiti and the Club are confident they can get the Barcelona defender. Mourinho is a huge fan of the 24-year-old France centre-back and Don Balon claims United will make a move to sign him at the end of the season. The report claims United are more than willing to match his release clause of £53million and Mourinho is confident of getting his man. Umtiti has won 14 caps for France and has played 23 times for Barca this season and is under contract at the Camp Nou until 2021. Barca are believed to be in talks with the player over extending his contract. Umtiti signed for Barca from Lyon for £21million in the summer of 2016.